How was your weekend? 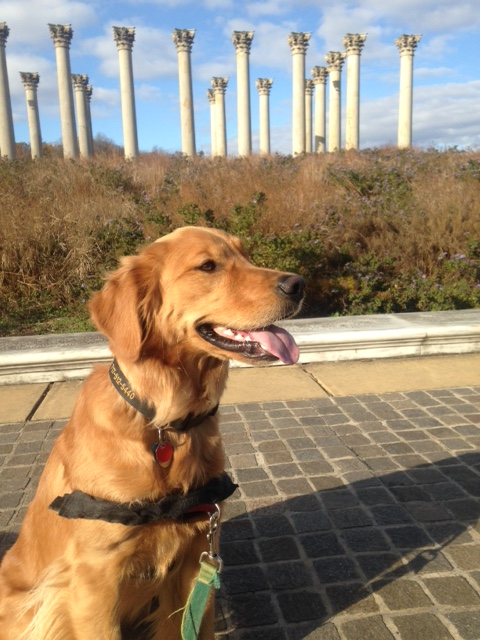 Ours was filled with equal parts adventure and relaxation…we started Saturday off with an adventure: taking Tucker to the Arboretum in DC! Saturday mornings are usually what we refer to as “Dadder-days,” meaning Jason gets up and takes care of Tucker while I sleep in. They go off on various adventures while I sleep the early morning weekday walks away. However, this weekend I crashed Dadderday as we both wanted to check out the Arboretum. I had been there once before when I first moved to the DC area and knew it was dog friendly as I went there in springtime with my mom and Spenser who had to come down and sniff out DC to make sure it was OK. However, the Arboretum is huge so we were in a completely different section this time. 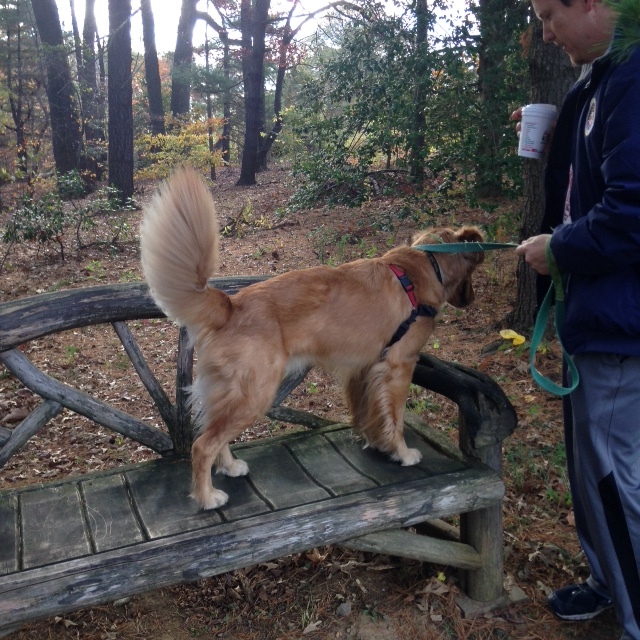 It’s a great place to bring your dogs as they have trails, paved and unpaved and it wasn’t too busy (though in fairness, we were there early and it’s also fall where nothing is blooming). I wish we had more time there but we had to go on our next adventure…. Off to Dogma, where Tucker got groomed. He’s been groomed once before and he really just needed a really good bath, comb out and trim which is exactly what he got. One side note, our local news recently did a story on groomers and the dangers of cage dryers. Please make sure that your groomer doesn’t use cage dryers!! Tucker returned home exhausted and I spent the time cleaning out my closet.. Yesterday was a basic stay around the house and walk around the park and neighborhoods kind of day though he did get to go play with his girlfriend Maisy since she was out in her yard. That was a nice respite as this week I’ll be traveling for work which means that Tucker and Jason will spend a lot of bachelor time together (probably watching Netflix). 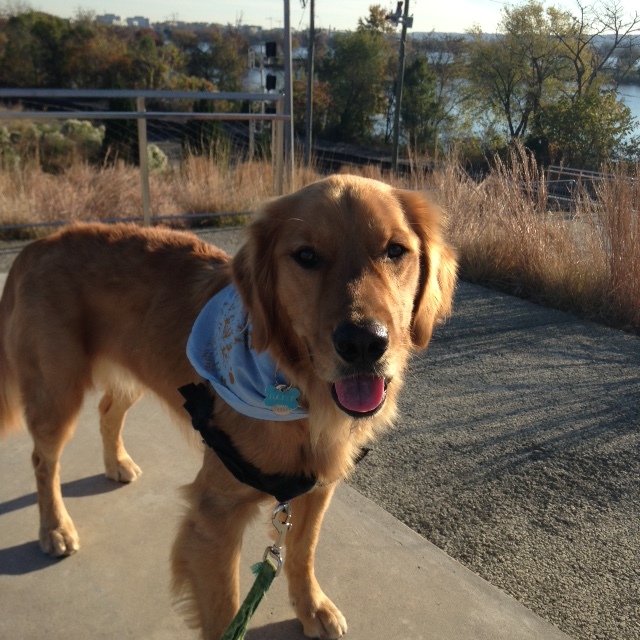 DVGRR’s Extraordinary Give: If you are a first time reader to this blog, Delaware Valley Golden Retriever Rescue (DVGRR) is very near and dear to my heart. My family adopted Oliver, a DVGRR rescue this February and he is the sweetest big fellow you ever met. Tucker, Oliver and Spenser have quite the bond and it brings me such joy to watch them together. The ExtraOrdinary Give is on November 20th and it’s Lancaster County’s largest day of online giving. DVGRR will be accepting donations. Please follow the link and give to this great cause. Great Dane With a Special Purpose: This story melts my heart. This Great Dane named George serves a very special purpose: as a service dog for a little girl with a rare medical condition. In this week of really horrific news, this is a bright spot. Reunited and it feels soooo good: Last week, our breeder Catherine with Ivywest posted a photo of Tucker’s brother Leo on Facebook. That led to photo sharing and story swapping of other siblings. I love hearing stories and meeting new puppy people – especially when they are related to Tucker! One non-dog thing: Ok, you may not think I have much of a life outside Tucker (I do! I do!) but I’m super de dooper excited about the news that the Dixie Chicks are touring in the US this summer. I absolutely love the Dixie Chicks and can’t wait to see them again! So what did you do this weekend? Share your pup photos and stories with me either blow or in an email to me via the Contact section above.I’d love to hear from you all!